Potatoes? We can't get enough, can we? I know. I think I have already told you before (Dum Aloo)? Love of ours for potatoes undeniably is undivided right (Gado Gado, Chilli Aloo, Bonda & Aloo Gobi)? I know and I bet you are agreeing. 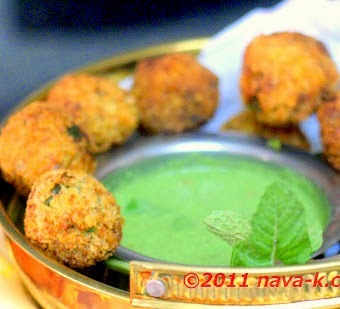 Today, its potatoes for these fried, crispy on the outside and soft bite inside absolutely (Sardine Rolls, Fried Shrimp Wanton & Tuna Cutlets) mouth watering Indian Potato Balls, paired alongside mint sauce. Add all ingredients except egg and bread crumbs into a mixing bowl. Shape into small rolls, dip into egg and coat all over with bread crumbs. Deep fry and drain excess oil. Process/blend all the ingredients together until smooth. 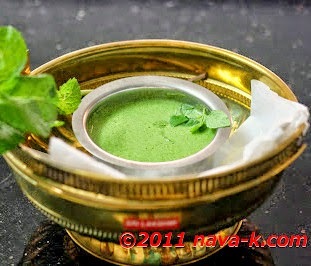 Serve rolls with mint sauce. Nava...you could make me potato rolls every day of the week and I wouldn't complain either!!! These look scrumptious! 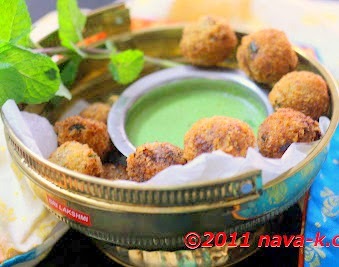 And the mint sauce seems like it would be a great accompaniment to other dishes as well! Thanks for these great ideas! is this some kind of Indian cuisine? coz we Chinese have potato balls (something like that, too) which are in brighter colors.. I'm not one to complain when it comes to potatoes too....whether fried or in curries. Thanks everyone for the comment and wonderful words. This looks like a Meditteranean food. BTW, I love the mint sauce! Happy Halloween to you too! That looks good--and I've always wanted a recipe for mint/chile dipping sauce. Thanks for sharing! You cook potato rolls every day, and I'll come and help you eat them. They look so delicious! thank you again everyone and appreciate all the yummy comments. Delicious, Nava! It's the same at my house....we love potatoes! I could eat potatoes everyday to lol and I would certainly eat anything you made with potatoes in it as I know each dish would be different and wonderful. These look good and the mint sauce sounds fantastic. This dish looks PERFECT...simple yet delish! i could eat potato everyday too. thank again to the rest and appreciate all the wonderful comments. These are so pretty and look so delicious. Thank you for posting the recipe.